with the 2nd video ever played on MTV (there's an bonus nugget for ya). (and the first record's Glen Alexander Hamilton). with an unexpected gong hit. I remember getting that first album ... it was on Chrysalis ... had that plasticy inner sleeve and cool logo ... the Blondie album was on it, also. Loved that label during the 70s and 80s. So cool. I wore the grooves out of the first one. Great drumming ... powerful ... creative ... POWERFUL. ... and I distinctly remember first seeing Myron for the first time ... and giggling at his stature. How could a little dude like that play so freeeeekin powerfully? That guy still puts a smile on my face. Loved a lot of her songs - such a tremendous vocal talent and solid rock presence. 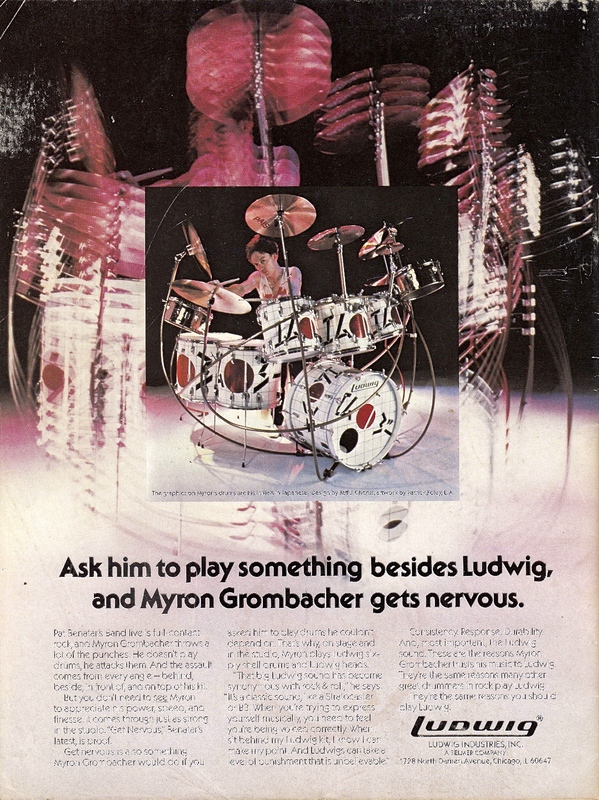 Never saw them live but I did see Myron at a Boston Zildjian Day in clinic, with the big white Ludwig kit in the Japanese finish. He did a fantastic clinic, played so well and had great info, and that kit sounded warm and just enormous. Highly energetic and a super nice guy. Neil Giraldo was/is a fantastic guitar player but his solo on Shadows Of The Night is a huge head scratcher to me. It sounds like he was doing a line test while tracking! They were a great husband and wife team. Pssst Buddy. We're not allowed to say we like Pat Benetar for another 6.3 years. The poor Nickleback fan still has about 23 left on his clock. Is there anything better than the intro to Shadows of the Night? I love it! One of the few early 80's MTV artists that had great songwriting and musicians. I too made the trek to Peaches records and tapes to buy that first album as a youngster. I couldn't have been more than 10 at the time. Myron rocking the Rogers in that Heartbreaker video. --Great vocals, great band with the ~Not underrated by me~ Myron Grombacher on drums. --Neil Giraldo plays interesting guitar solos (I just learned he and Myron were previously with Rick Derringer). Speaking of Derringer, the stand-outs* for me from the "If I Weren't so Romantic, I'd Shoot You" album are "Easy Action," "Midnight Road" and "Lawyers, Guns and Money" (W. Zevon cover), check 'em out! EDIT: Now that I recall, I liked "Sleepless" and the Grombacher penned "Attitude" too... actually it's a pretty solid album! Promises in the Dark by far my favorite Pat Benatar tune. Myron managed to inflict some pretty good dents in those tom heads. Cool that Pat and Neil are still together after all these years, AFAIK. I just listened to that solo again. I think it is very much so creative - as it is so different. What he is doing there totally works (IMHO) in a totally unique and richly stylistic way. He had only been a drummer for 12 years at that point in time. Wow! Ah Peaches! We used to go to one that was down in South Miami. I was about the same age. My folks had the Peaches wood crates that they sold to hold all the 33's. I finally got around to watching those. I liked some of the phrasing differences on the guitar on Best Shot, even though the original's phrasing is one of the things that really makes the song. I know that people (including Pat) are REALLY tired of this song but I've always loved the guitar phrasing in it and found that part in particular really interesting. To be fair - I didn't discover it until a decade after it's heyday. They introduced John Cougar Mellencamp's "I need a lover" to a wider audience.